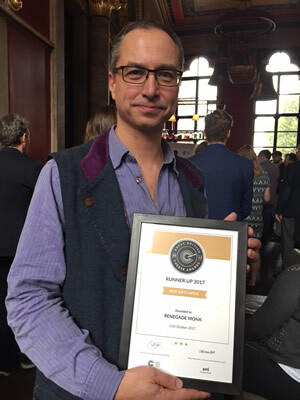 Feltham’s Farm, makers of Renegade Monk cheese, was recently awarded Runner-Up in the Best Soft Cheese category at the Great British Cheese Awards in London. In contrast to other awards, these are nominated by the public – and over 500 cheeses were nominated. From these public votes, a shortlist of cheeses was drawn up. Renegade Monk was shortlisted for Best Soft Cheese and Best Artisan Cheese Producer. About a dozen cheeses and producers were selected in each category. Though Renegade Monk didn’t win the category it was an honour to achieve Runner-Up, particularly given that the cheese is currently only on sale in Somerset and Dorset, and has only been available since March 2017. In addition, Renegade Monk recently won Gold at the Global Cheese Awards 2017, held in Frome. It won in the Artisan Cheese section (less than 5 tonnes per week) under the category of ‘Soft cheese, with or without rind’. Feltham’s Farm, Horsington Marsh, Templecombe, Somerset.